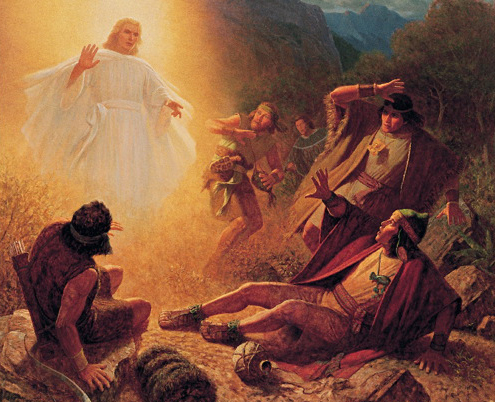 Aaron, the son of King Mosiah, was one of four brothers who persecuted Nephite Christian church members until an angel appeared, and called them to repentance. In The Book of Mormon, Aaron was a rebellious son, unbeliever, and friend to Alma the Younger, who caused much dissension in the church. After the angel’s visit and his conversion, Aaron tried to repair earlier damage, and became a great missionary after refusing to be king. About 92 B.C., Aaron traveled as a Christian missionary to preach for 14 years to the Lamanites. Aaron preached unsuccessfully to the Lamanites (enemies to the Nephites) in the lands of Jerusalem, Ani-Anti, and Middoni. Many people contended with the missionaries, and asked Aaron why angels didn’t appear to them. The Lamanites did not listen to their teachings, cast Aaron and others into prison, and inflicted many sufferings upon them. Fortunately, God sent King Lamoni and his brother Ammon to deliver them from the Lamanite King Antiomno’s prison. In the land of Nephi, Aaron taught King Lamoni’s father who was the king over all of the enemy Lamanite lands. [Aaron] bowed himself before the king and said, “Behold, O king, we are the brethren of Ammon, whom thou hast delivered out of prison” [v. 2]. He then said if the king would spare their lives, they would be his servants. The king refused to allow them to be his servants but said he would like them to administer unto him because he had been somewhat troubled in his mind because of the generosity and the greatness of the words of Ammon. He asked Aaron why Ammon had not come up from Middoni. Aaron explained that the Lord had called him to go to Ishmael, to teach Lamoni’s people. Aaron then taught the king about God [or the Great Spirit, as the king referred to him] and about all things from the creation and about the plan of redemption. Aaron’s persistence, faith, and endurance resulted in bringing thousands of Lamanites to the knowledge of the Lord. “[He] brought many to the knowledge of the truth”. These converts never fell away from their faith and became a righteous people. The example of these converts led to over 1,005 wicked Lamanites’ conversions. However, no Amulonites (descendants and followers of the wicked men Amulon and King Noah’s priests) were converted, but one of the Amalekites (apostate Nephites) did convert. 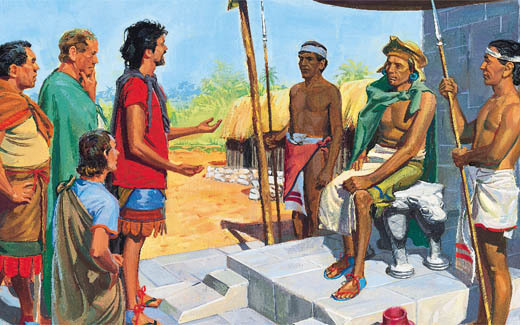 Many Lamanites later remembered Aaron’s teachings and perished by fire because of their refusal to deny their belief. (See Alma 25:5). The Lamanite king wanted a name to distinguish the believers from their wicked brethren. 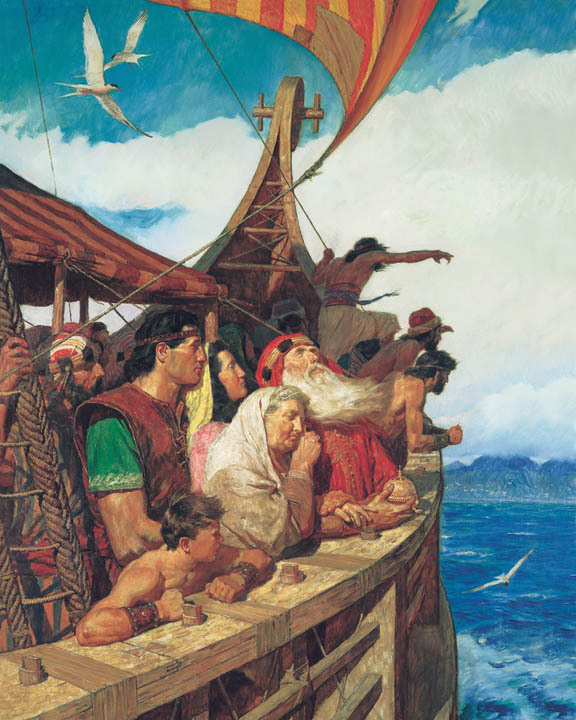 After consulting with Aaron, the converts chose to be called Anti-Nephi-Lehies and “laid down their arms and vowed they would never fight again”. The king (father of King Lamoni) named his son Anti-Nephi-Lehi as heir of the kingdom. Hugh Nibley suggests that “anti” is from the root word that connotes “facing,” as in facing a mirror, and thus “Anti-Nephi-Lehi” may mean that the people “mirrored” the teachings of [the ancient prophets] Nephi and Lehi. (Greg Bishop, “Book of Mormon Gospel Doctrine Lesson 26,” 3). 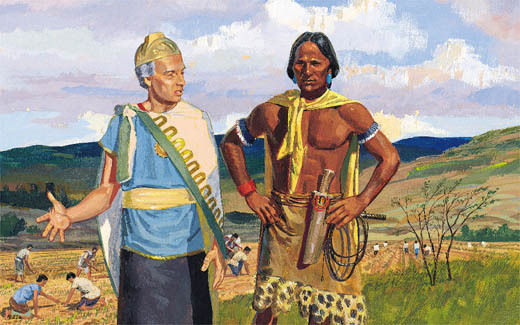 Shortly after the king’s death, the Lamanites began a war against the converted Lamanites (Anti-Nephi-Lehies). However, these believers had sworn to never take up arms again, and buried their weapons “deep in the earth” rather than defend themselves. 1,005 righteous Anti-Nephi-Lehies died because they refused to fight or resist the attacking Lamanites. One scholar has suggested that the Lamanite religion glorified warfare, bloodshed as a religious act, torture and human sacrifice. He suggests that the Lamanites came from a worldview that told them that it was essential to shed the blood of sacrificial victims. In the process of being converted, however, they learn that the only sacrifice needed would be that of a future Atoning Messiah. Thus, the reason why the people of Anti-Nephi-Lehi resolve never to touch arms again is not because they believed that self-defense was wrong or immoral, but because – like alcoholics – they must be constantly vigilant. Rather than risk a return to their former taste for sacrificial blood, they chose to avoid even the very first step along that path. (See Brant A. Gardner, Second Witness: Analytical and Contextual Commentary on the Book of Mormon, Vol. 4, p. 355). (Greg Bishop, “Gospel Doctrine Lesson 26”, 3). Aaron journeyed to the land of Zarahemla with the Anti-Nephi-Lehies and “the king was concerned that they would not be warmly welcomed because of their past murders.” Aaron met up with Ammon and rebuked him for boasting too much but Ammon had been rejoicing in the glory of God. On their way, they were joyful to find Alma the Younger, who advocated for them among the Nephites in Zarahemla. The Nephites gave the Anti-Nephi-Lehies the land of Jershon and called them “the people of Ammon.” About 76 B.C., commenced the biggest battle since the beginning of the Book of Mormon. *This article was adapted from the LDS Guide to the Scriptures and Every Person in the Book of Mormon by Lynn F. Price (Horizon Publishers, 2004, 53-54).